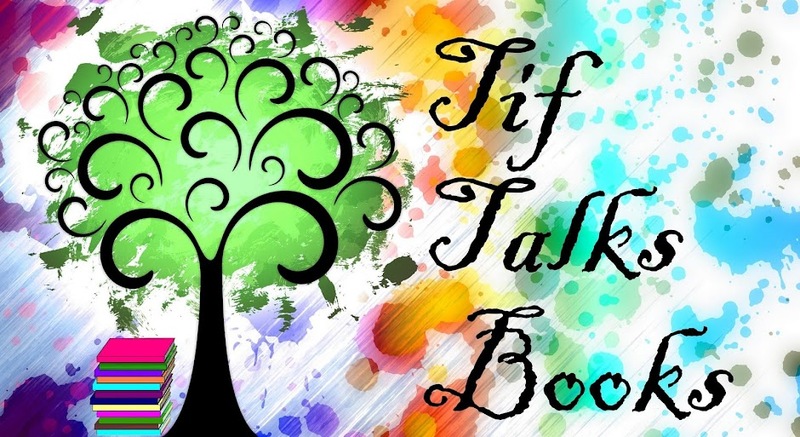 TIF TALKS BOOKS: My Book-ish Treasures! 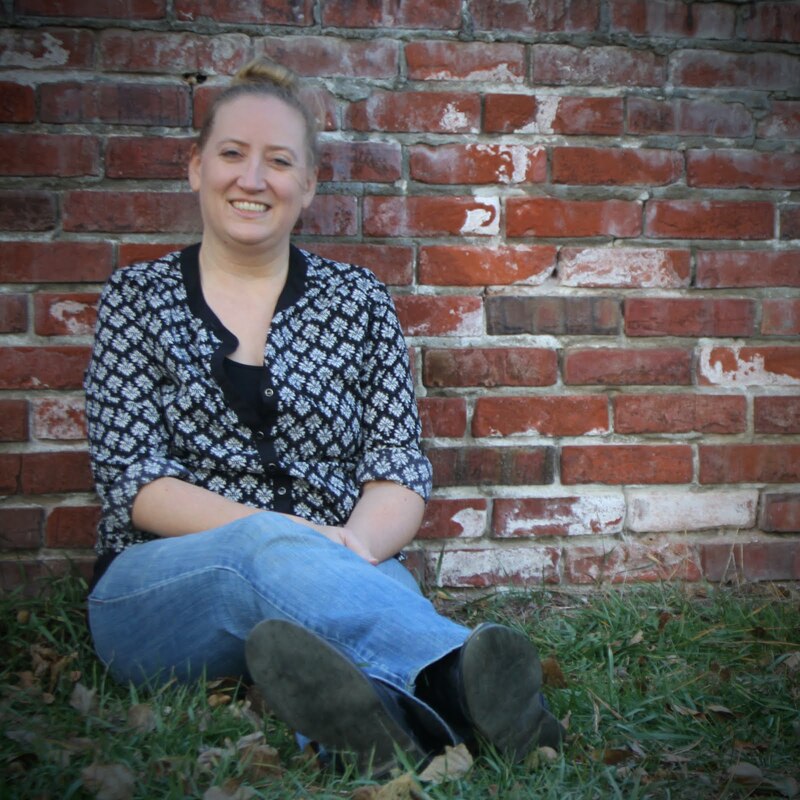 In honor of Armchair BEA, I have decided to share some of my book-ish treasures with you! What I am about to share with you are some of my most prized possessions, those items that I hold very close to my heart . . . . of course, right after my family!! I have included a little story with each picture, so read on and enjoy! Back in 2003, I attended my first ever author event and signing. 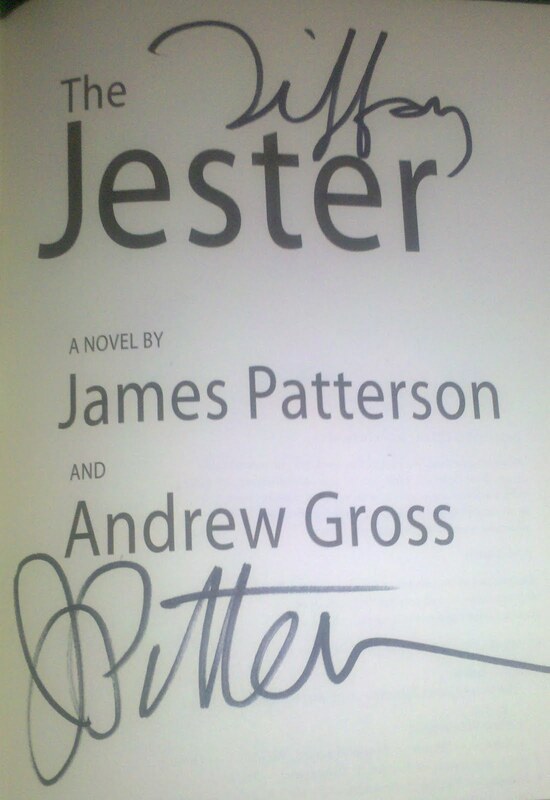 It was with James Patterson for his release of Jester that he co-wrote with Andrew Gross. When my friend and I heard that he was going to be at a local indie, we could not pass up the opportunity! We showed up early, got seats towards the front, and were poised to listen with interest. It was a packed affair, but one completely worth it! Patterson was surprisingly funny and a wonderful public speaker. He got me hooked on author readings and signings from that day forward! Later that year, I was lucky enough to get a part-time job working at the same indie bookstore! And, I got in on the action of many author events! One of my favorite was Gregory Maguire during his release of Mirror, Mirror. 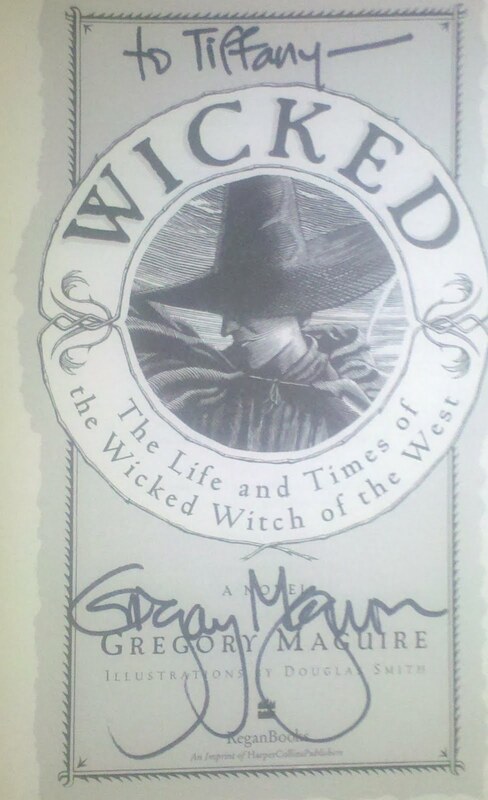 I love, love, love his first adult novel, Wicked: The Life and Times of the Wicked Witch of the West. It was a fabulous event and I have to say, he is one of the kindest authors that I have ever met! He was generally interested in every person he spoke with and was willing to sign a whole stack of books for me! I wanted to include this book, Ender's Game by Orson Scott Card because this was one of my surprise signings. The author just happened to be in town for a community reading event and he agreed to stop by and sign some stock inventory. I was lucky enough to be working the day he walked through the store doors and I helped bring him armful of books to sign, chatting briefly with him while he did so. How could I not get a book after that?!?! I actually read this book after meeting him, and still wonder to this day why I waited to long to crack that book! 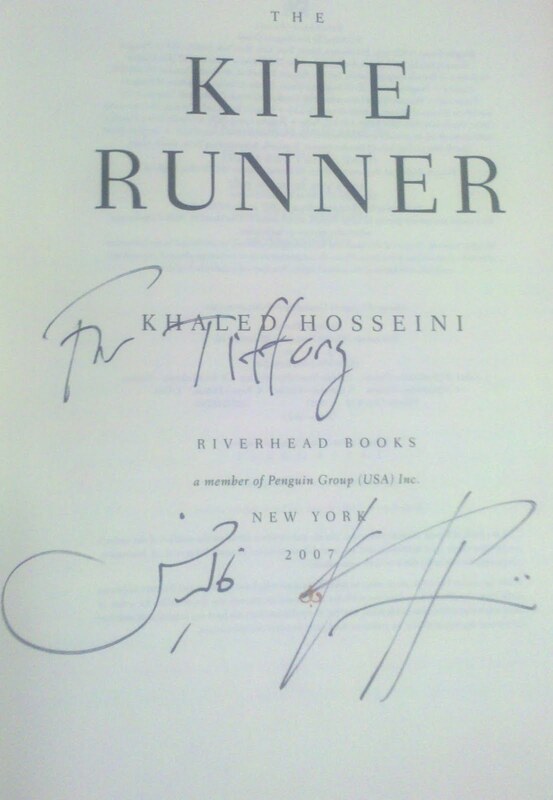 Last, but not least, is probably my all-time favorite signing event with Khaled Hosseini! 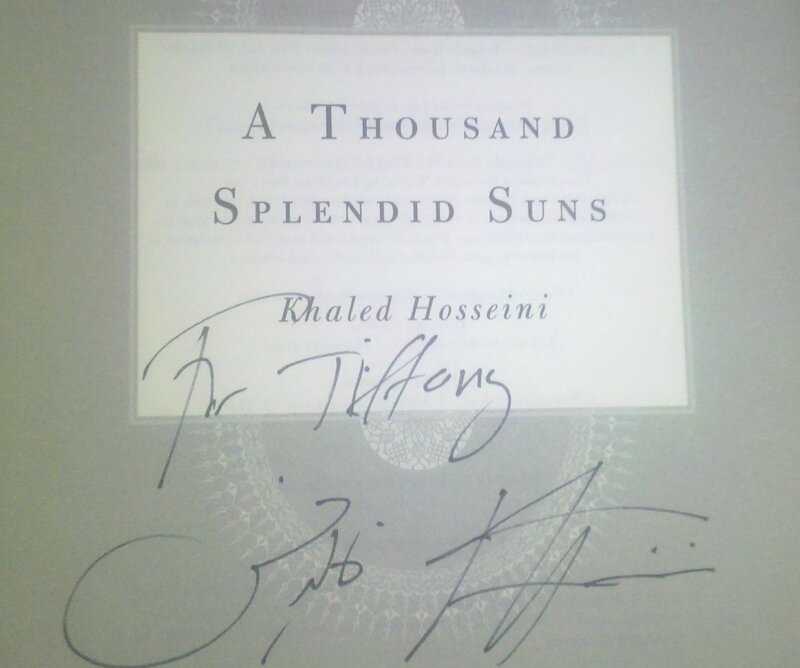 Thankfully, I was blogging at the time I attended this one, so you can check out my thoughts and details of this reading (including a picture of the author signing) at A Conversation with Khaled Hosseini. Other authors that I have been lucky to enjoy . . . Ivan Doig (interesting), Patrick McManus (hilarious), Pete Fromm (awesome), Elie Wiesel (inspiring!) . . . and a few that I've overheard just from working in the bookstore include Jan Brett, Chuck Palahniuk, Sherman Alexie. I really wish that I had actually seen these ones instead of just heard! Despite the many author events I have been to, I still cannot get enough time with them!! I was recently looking at some events that will be offered in my area and I'm really, really hoping that I can go to many of them. As I do, I will be posting them here at Tif Talks Books! Who would be my dream authors to meet? My faves that I wrote some fan mail to just the other day . . . J.K. Rowling and Stephen King . . . but, there are others I would also add to this list including Suzanne Collins, Shannon & Dean Hale, Janet Halfmann, Sandra Boyton, and so many more!!! Maybe some day . . .
Who do you dream about meeting? I simply adore autographed books. I must organize them better. Great idea to photograph the autograph. I attended BEA in 2008 (in LA) and got a few books then. And I've also received a few from other authors as review copies. You have met some AMAZING authors! Elie Wiesel? 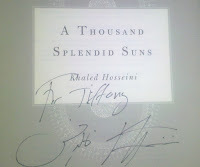 Khaled Hosseini! Wow! 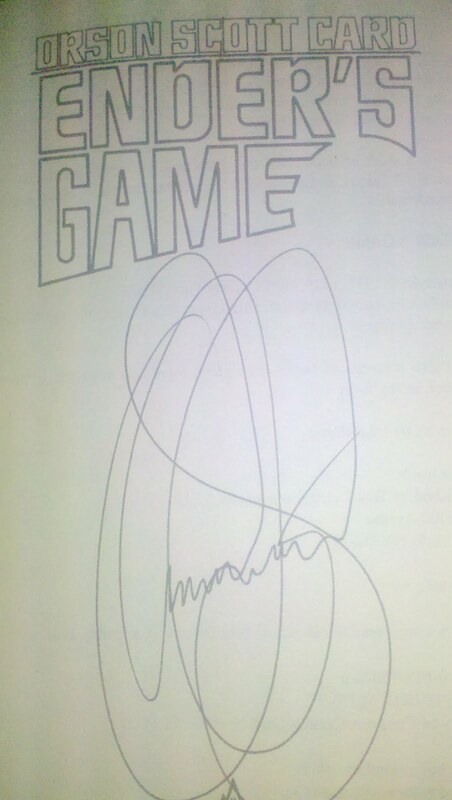 I have to admit to being jealous of the signed Ender's Game. That's very cool! I would love to meet Lisa Kleypas or Barbara Mertz, or LJ Smith. Wow, you are lucky to have such treasures. I'd love to meet and have a book signed my Markus Zusak (The Book Thief). Those are some serious treasures. I'm impressed. Creations by Laurel-Rain Snow . . . I don't organize mine very well! They are really spread out all over the place, but my really special ones get the top shelves!! Emily . . . I didn't actually meet Elie Wiesel . . . just listened to him speak! Both were absolutely amazing though!! carolsnotebook . . . Ender's Game does not get the attention it deserves in my opinion! Amazing!! Kathleen . . . I just keep hearing amazing things about Zusak and The Book Thief! I really need to give in to the peer pressure on this one! Alexia561 . . . Working in a fairly large bookstore a while back really helped to add to my collection!! Kristen M. . . . He was amazing!! I would love to see him again someday! !